“Ready, shoot, aim.” Unfortunately, that’s the all too common description of the field sales person’s modus operandi. In a misguided attempt to stay busy and see as many people as possible, too many sales people subscribe to the theory that any activity is good activity. There was a time when this was true. Customers had more time, sales was a simpler job, and any conversation with a prospect or customer was a good thing. But times have changed, and the job of the sales person has become much more complex. The pressure on the sales person to make good decisions about the effective use of his time has never been greater. Sales people now must confront an overwhelming number of potential “things to do,” and that requires them to make decisions about which customers in which to invest their time, to prioritize their activities every day, and to continually choose from a menu of possible activities. In other words, sales people must now engage in strategic planning. Not that this is new. There have always been sales people who have regularly planned strategically for the effective use of their time. It’s been a characteristic of superstar sales people and highly effective sales forces. For that small percentage who do it instinctively, or are encouraged to do so by their management, it’s as much a part of their routine as brushing their teeth in the morning. Unfortunately, that describes the minority of sales people and sales forces in the world. What was a practice of only the best has now become a requirement for everyone. Most sales people have never been trained in the best practices, processes and disciplines which will set them apart from the pack. In this case, that means that most sales people have never been exposed to the principles, processes and disciplines of effective strategic planning. Let’s define our terms. A strategic plan is composed of a set of measurable goals, coupled with a list of the most important, most effective things you (or your company) can do to reach those goals. 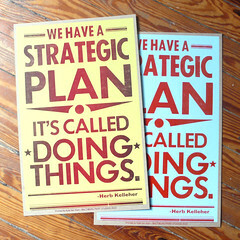 A strategic plan is not a detailed action plan. That comes later. The plan itself is often limited to no more than two or three pages. The idea is to identify the highest priority and most effective. Too much detail defeats the purpose. Strategic planning is the process of thinking about your job (or your company) in such a way so as to develop your strategic plan. Creating a strategic plan for your company always involves a dedicated chunk of time devoted to the process. So, too for a strategic plan for a sales person. Creating a strategic plan for your company always involves some preparation, and a gathering of the best minds in the company. So, too for a sales person’s strategic plan: Preparation, and a melding of the ideas of the sales person and his/her manager. Strategic planning for your company always involves the discipline to adhere to a formalized process. So too for a sales person. With your company, the creation of a strategic plan is often an energizing, inspiring event, from which everyone leaves optimistic and full of confidence, assured that they have identified the goals, plans and tasks that will bring them the best results. And that is exactly the benefit for a sales person creating a strategic plan. Sales people spring up out of the strategic planning process confident that they have identified the most effective focus for their action, that they have identified the highest priority activities. They emerge confident, focused and optimistic, ready to take on the world (or at least their customers) with renewed vigor. And that’s a good thing! 1. Set aside, once a year, a significant amount of time dedicated to the task. I’d suggest at least a full day or two. The date of the strategic planning session should reflect the sales person’s selling situation. Sales people vary in their seasonal “busyness” depending on the industry to which they sell. For some, a time towards the end of their fiscal year might be in order. For others, a time at the end of their busy season. For most, a time around the Christmas holidays works best. One of my clients brings all his sales people into the office for a planning retreat once a year. 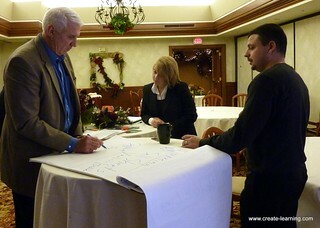 In another, sales people come together for an annual goal setting and strategy developing retreat. 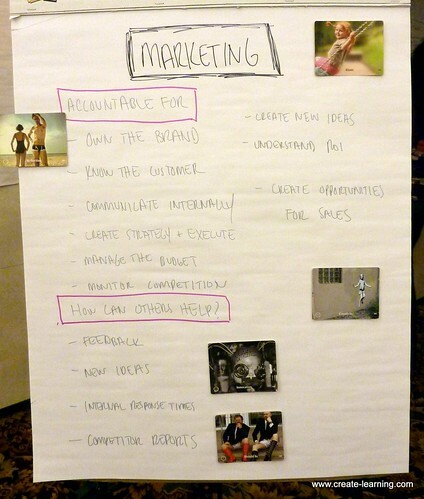 At this three-day event, they meet with their sales manager and create specific goals for the year. Then, together with the manager, they jointly develop the overall strategy for achieving those goals. If your company organizes such an event, good for you. If not, then you need to do it yourself. 2. Find a space where you can work virtually uninterrupted. This may take some creativity. I doubt if it’s your company office. It may be your home if you have a room in which you can seal yourself. One year, I was one of two people responsible for leading an organization. The two of us drove to a state park, climbed in the back of my old conversion van, and worked in the back of the van all day long. We were isolated and uninterrupted. 3. Gather the materials you’ll need: all your account folders, account profiles, your company’s goals for the year, information about key products, services, or categories, computer print-outs of last year’s sales, maps of your geographical territory, and anything else you may want to review. 4. Immerse yourself in the process. For the duration of the planning, don’t do anything else other than emergency tasks. You want to focus your thinking on the strategic decisions you’ll be making. Any interruption will disrupt your thinking. A set of sales goals for your territory. A well-defined ABC analysis of your customers and prospects. Individual goals and strategic plans for each of your key (A) accounts. Sounds arduous, and it is. But, when you spend disciplined, focused time thinking about these things in detail, you will find it to be much easier than it sounds. You will prepare the best, most effective plans of which you are capable, and that will free you to implement effectively when you are in the field. Later in the year, you won’t be tempted to head out on Monday morning without a clear plan in mind, because you have spent this time formulating the plan. And when the press of customer problems and inquiries threatens to overwhelm you and force you into becoming too reactive, you’ll be held on track by the goals and plans you created in your planning discipline. Let’s consider each of these four outcomes of your planning retreat. 1. A set of sales goals for your territory. Total sales per product category (dollars, gross margin, or units) for each of several categories of product or service you sell. Goals for acquiring new accounts. This is just a list of the most common sales goals. You can have a virtually unlimited variety of goals. The categories of goals are up to you, your company, and your manager. I’d suggest no more than five categories. Remember, one of the reasons you create goals is to help you focus your energies on the most important issues, and thus become more effective. More than five goals defeat that purpose. Too many goals cause you to diffuse your energies, not focus them. Total number of “Superscrubbers,” our new, high-tech machine. Total sales of supplies (as opposed to equipment). Now that you have determined which categories on which to focus, you next need to create specific numbers for each. This is where the art comes in. You consider your company’s goals, you consider your understanding of what the market is doing, you factor in your best understanding of what your competitors are doing, and you consider your customers’ situations, as well as your situation. Out of this comes your best attempt to predict a result that will cause you to stretch, but not be unreasonable. I prefer to look at each account individually, think about it, and determine its likely contribution to each of the categories. Examine each account, analyze the potential, consider your situation, and determine a realistic goal. Go on to the next account, and do the same. Then compile each of the numbers from the specific accounts, and presto! You have an annual number. 2. A well-defined ABC analysis of your customers and prospects. When it comes to strategic planning for sales people, one of the most important strategic exercises is determining in which accounts you want to invest the bulk of your sales time. Too many sales people become very reactive in their decisions, responding to whoever happens to be on the other end of the phone. Others find themselves in a route-type rut, mindlessly traversing their sales territory out of habit. The cure to both of these issues is to strategically think about the potential of each account, and then to rank each account into one of three categories based on its potential. I describe a system to do this in Chapter Six of my book, 10 Secrets of Time Management for Salespeople. The result of this exercise is to have graded each of your prospects and customers as either “A” (highest potential), “B” (medium potential), or “C” (low potential). 3. Individual goals and strategic plans for each of your key (A) accounts. If you are in the kind of selling position where you are attempting to sell more to certain key accounts, then you need to create specific, monthly strategic plans for each of those key accounts. For now, let’s assume that you have prioritized your accounts and that you have a list of your “A” accounts. In the typical sales territory, around 50 – 80% of your business is going to come from this group of accounts. That means that these accounts warrant special attention, special preparation, and special thought. You ought to apply the disciplines we have already discussed to your “A” accounts. In other words, create annual sales goals for each “A” account, and think about how you are going to do that, one account at a time. .
4. A basic plan for your territory. You have, at this point, decided what you want to do (your goals), with whom you want to do it, (your ABC categories), and how you are going to do that (your key account plans). Now, it’s time to put all this thinking together into an implementation plan. This is your basic plan for the use of your sales time. Where are you going to be on Monday? How will you manage that trip to the outer reaches of your territory? When will you schedule office time? Lay out your basic schedule of how you are going to travel your territory. Make sure that you focus your time and attention on the A accounts, and that you work in time for the achievement of all your goals. When you have done that, you will have created a sales person’s strategic plan. This annual exercise in discipline and thoughtfulness will serve you well, guiding you to the most effective use of your time, and keeping you focused on those activities that will bring the greatest result. And that is well worth your time. Image “The Posters are BACK!” by Kyle Van Horn on Flickr under Creative Commons license. 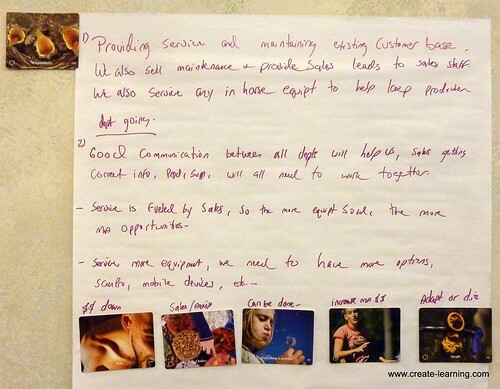 Series of images titled “Strategic Planning Meeting” by Michael Cardus on Flickr under Creative Commons license.